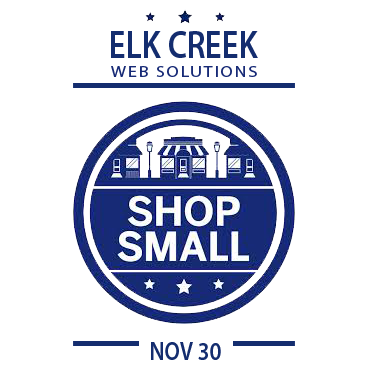 In honor of Small Business Saturday, we at Elk Creek Web Solutions want to make an offer to all of the Small Businesses that make our communities what they are. Any business that responds to this promotion and contacts us will be eligible to receive any of the following offers. 6 Months FREE basic web hosting and maintenance with 1 year contract. A $240 value! 9 Months FREE basic web hosting and maintenance with 2 year contract. A $360 value! 10% off of any web design and development package up to $5,000. Up to a $500 value! We are offering these deals because we know that helping other small businesses grow and thrive with an outstanding online presence helps all of us grow. The rising tide lifts all ships as they say. Join us on November 30th and we’ll grow together!